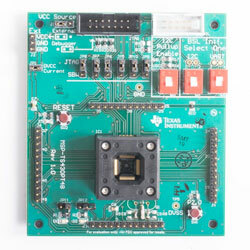 The Texas Instruments MSP-TS430PT48 microcontroller development board is a standalone ZIF socket target board used to program and debug the MSP430 in-system through the JTAG interface or the Spy Bi-Wire (2-wire JTAG) protocol. This development board supports the MSP430FR2355 FRAM devices in a 48-pin QFP package. You can check your target’s device documentation to find the correct target board. A debug probe can also be purchased independently or bundled with the target board.